Within Sun Ra’s vast-as-outer-space discography, the album that orbits the furthest away from the known jazz universe is Strange Strings. Calling it a “study in ignorance,” Ra directed his Arkestra stalwarts to pick up unusual stringed instruments and homemade percussion with which they had little familiarity, and improvise without any guidelines or direction; the resulting record is one of Ra’s best. Now, Roaratorio is proud to issue a satellite around that lonely planet: Other Strange Worlds, recorded in Ra’s NYC apartment in May of 1965, dates from the same era and employs the same methodology as Strange Strings. But while the latter album featured the full Arkestra,Other Strange Worlds pares the players down to a core quintet of Ra, John Gilmore, Marshall Allen, Art Jenkins, and Ali Hasaan. There’s plenty of freewheeling collective improvisation in the Ra catalog, but rarely in a small-group setting such as this. Half of the pieces are texture-over-tonality string experiments, while the rest feature exotic reeds and percussion. 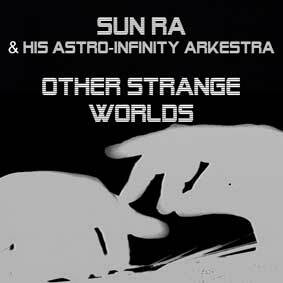 Other Strange Worlds is a significant addition to Sun Ra’s body of work, and a brilliant example of free improv from the days before it had a name. Download coupon included.